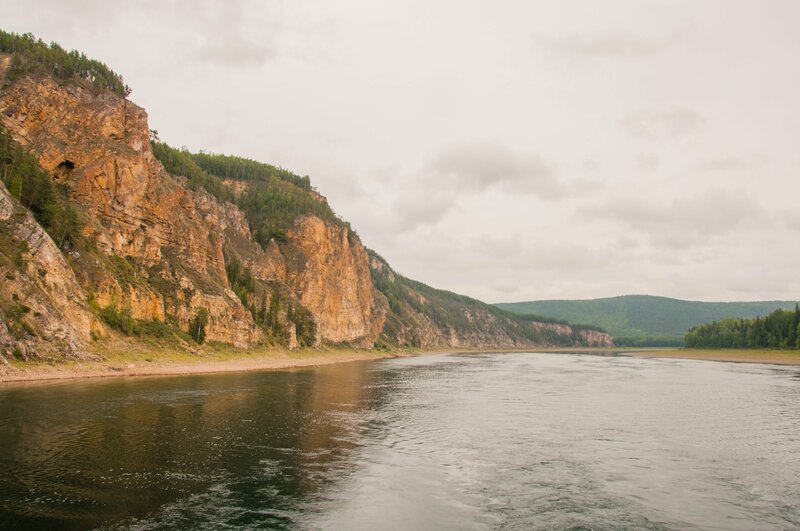 The grand Lena River captures attention with its stunning beauty and brute force. It’s also the place where the remains of possibly the first modern humans where found. When boarding a barge in Ust-Kut, I knew we were in the final stretch of our trip. Now all we had to do was to travel down the Lena River for five days and cover 800-km northeast before landing in the town of Lensk in the Sakha Republic (Yakutia). A unique thing about the Lena, one of the three great Siberian rivers (the other two being the Ob and the Yenisei), is that it’s the largest river whose waters flow entirely within Russia. The name Lena wasn’t derived from the popular Russian female name, but rather it came from the Russianization of the Evenk word “Ule-Uena,” which quite literally means Big Water. I’ve got to admit Evenks were awesome at naming places. 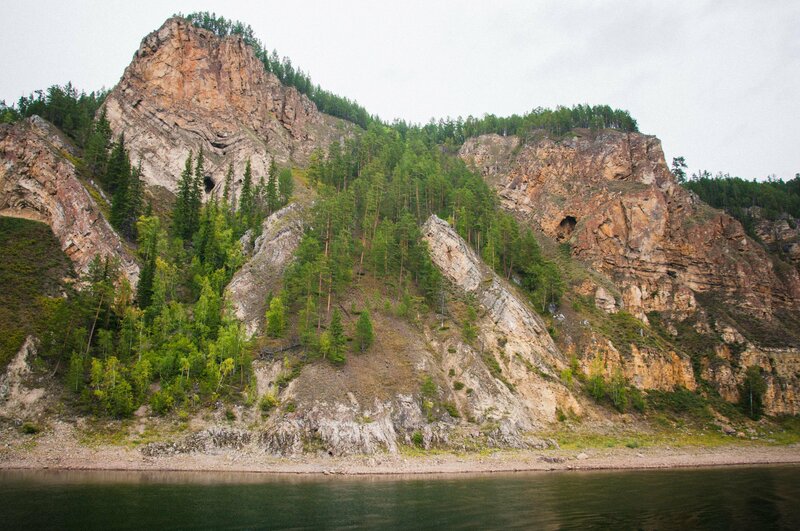 Although the Lena starts in the Irkutsk Oblast just north of Lake Baikal, most of it flows through Yakutia, Russia’s largest region in terms of geography and the unique land of diamonds, mammoth bones and the coldest temperatures on Earth. 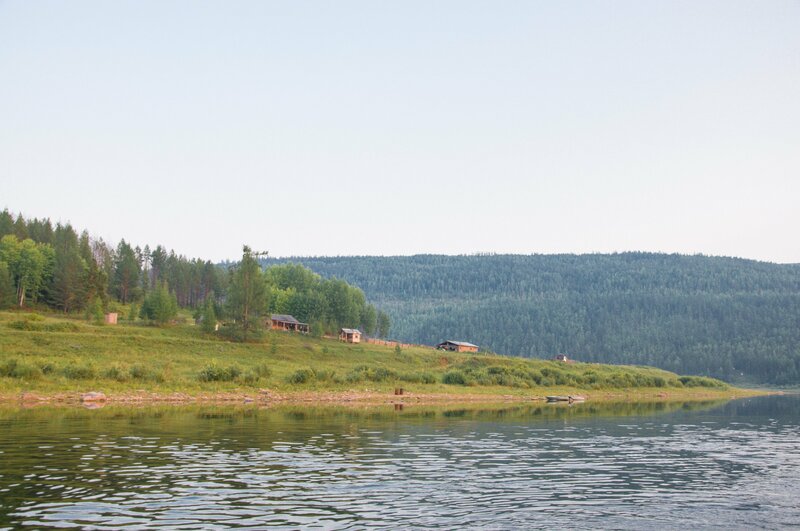 Along its course, the Lena offers some of the most spectacular views in Siberia. We only covered a small portion of the Lena while taking a barge from Ust-Kut to Lensk, but still had an opportunity to see some of nature’s unique scenes. One of them was a series of natural cliff formations, known as the Lena Cheeks (Lenskie Shcheki), created by ancient seismological processes. Apparently, archeologists have found the remains of prehistoric people who lived in and around these pillars along the Lena River tens of thousands of years ago. Some even claim that if scientists figure out the exact time period of these human remains, then a theory of humans’ African origin might be called into question. This would make ancient Siberians the first people on Earth. If this is obviously up to a future scientific debate, for an old hermit living in a wooden hut on the edge of the Lena Cheeks until recently is a fact. We saw the rundown cabin, but it was empty. The captain of our barge told us that in the past an old man used to come out of his hut and play harmonica when ships and barges were passing by. “I think he was a bit crazy in his head. He lived here all year around, only occasionally going to a nearby village to get some essentials. I heard he’d decided to live alone in the wild after his wife died in an accident,” the captain told me. According to the captain, the old hermit probably passed away or due to the old age was taken to a village, probably against his own will. So we weren’t greeted by harmonica music when passing the cliffs. We passed a couple of small settlements that didn’t have electricity. The local government has to provide diesel generators so that people could at least have electricity for a few hours a day. I just couldn’t imagine the hardship of living in such conditions for a long time. The Lena offers a unique geographical and cultural landscape. One of the greatest Siberian rivers could be explored on a cruise ship during the summer time from the city of Yakutsk, which has regular flights to all major Russian cities, including Moscow and St. Petersburg.